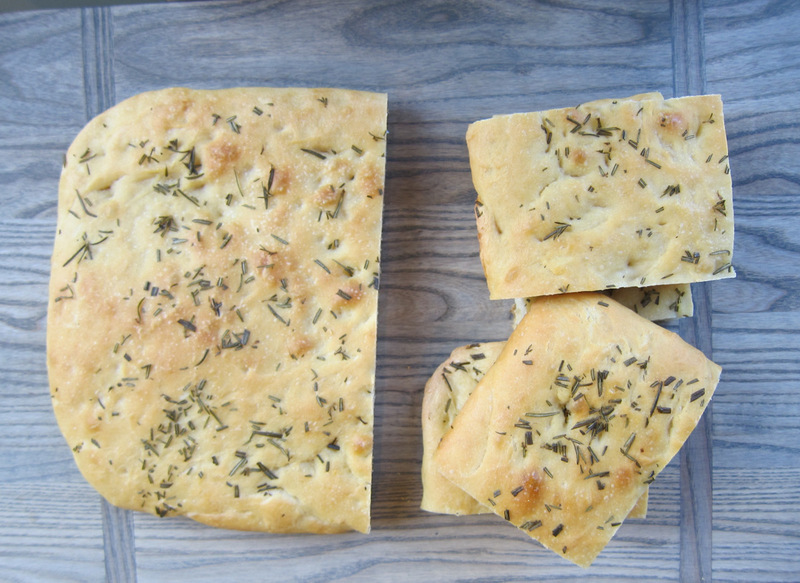 In Italy, rosemary focaccia was an early-morning bakery snack, warm and ready to eat. Rosemary focaccia hardly needs an introduction. It’s well known. A flat bread baked in olive oil, it’s moist and keeps very well. When we rented houses in Italy, school kids would line up early in the morning at the local bakery to buy squares of onion, tomato or salted rosemary focaccia to eat on the way to school. It also was used for sandwiches. My favorite fillings include ham and pecorino drizzled with white truffle oil, or filled with mozzarella and tomato. But my favorite guilty pleasure is to make a focaccia sandwich filled with paper thin slices of the Italian peppered bologna called mortadella. And rosemary is surprisingly good with tuna salad. I love to split and toast it, too. 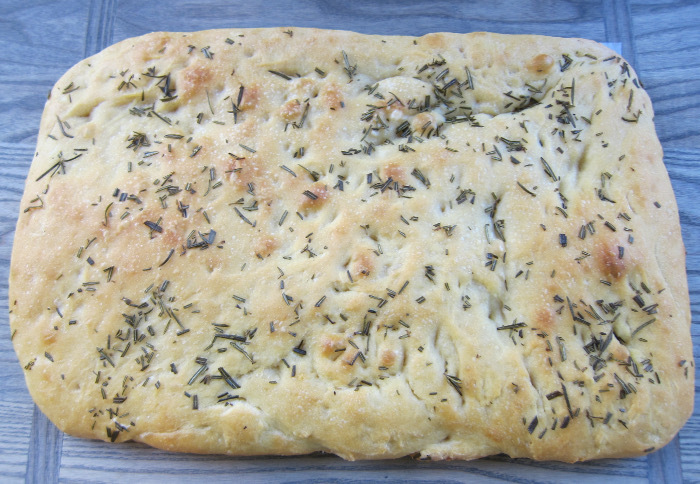 Rosemary focaccia is a great basic party bread. Cut into small squares, it will serve 24. Cut into larger squares and split, it yields 12 sandwiches. This recipe is very easy and a lot of fun at the end — you’ll see why. The dough rises slowly but that leaves time to do other things. My starter gets mixed in a 1 quart container. I note the level of the starter just after it’s mixed. And it’s easy to tell when it’s doubled in volume, bubbly and active. Any kneading method can be used for this dough. I almost always use my food processor which kneads the dough to a silky, smooth consistency in about 1 minute to 1 minute and 30 seconds. When fully kneaded the dough has a silky surface texture. Then kneaded dough rises in a warm, wet mixing bowl which I slip into a clear plastic grocery store bag and clip closed. That’s easier than using plastic wrap, I think. Here’s the fun part. But first, wash and dry your hands!The bottom of the pan is covered by 1/2 cup olive oil and 1/4 teaspoon salt. 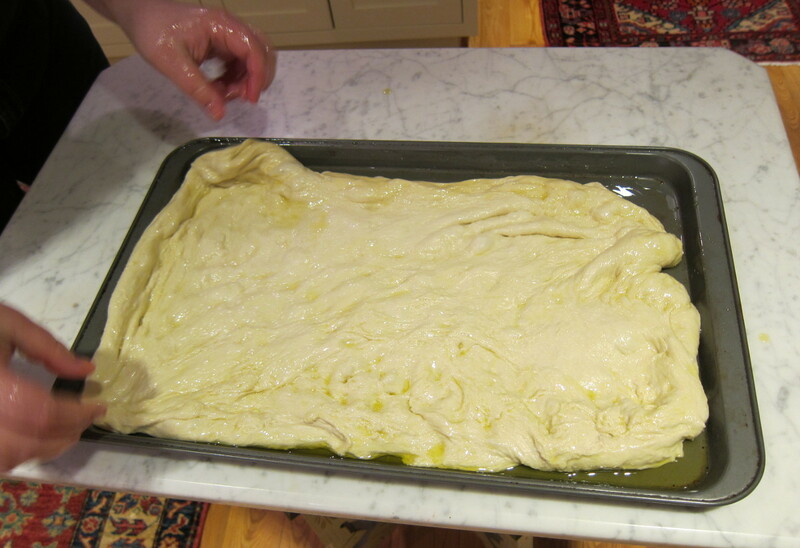 Then the risen dough goes into the pan without kneading and is flipped over so it’s completely drenched in oil. 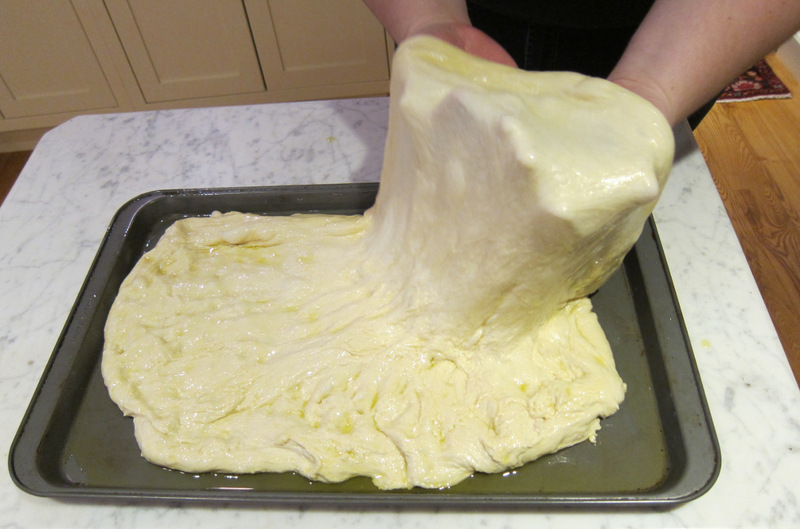 Then get under the oily dough on one side and stretch it with the back of your hands, working from the center. Depending on how the dough stretches it may be necessary to stretch it from the middle with both hands — that will keep the thickness even as well. It also may be necessary to stretch from one side at the end. Just get the dough to fill the pan as much as possible but don’t worry if it doesn’t completely reach the corners as it will when it rises. Strip off the rosemary leaves by grabbing the top end and pulling backwards — this is a natural “herb stripper.” If dry rosemary leaves are used, crush them well in your hands to release the essential oils and fragrance. For the final rise (about 2 hours) I tent it with 2 grocery bags pulling them up so they don’t touch the top of the dough. 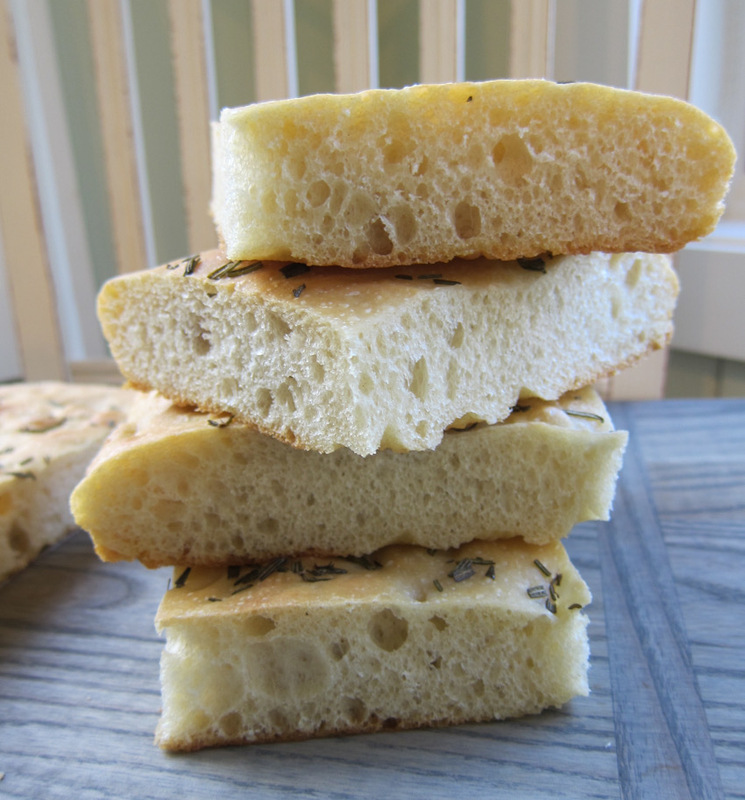 Once baked, focaccia can be cut and eaten warm, or at room temperature. It reheats well and keeps for several days. 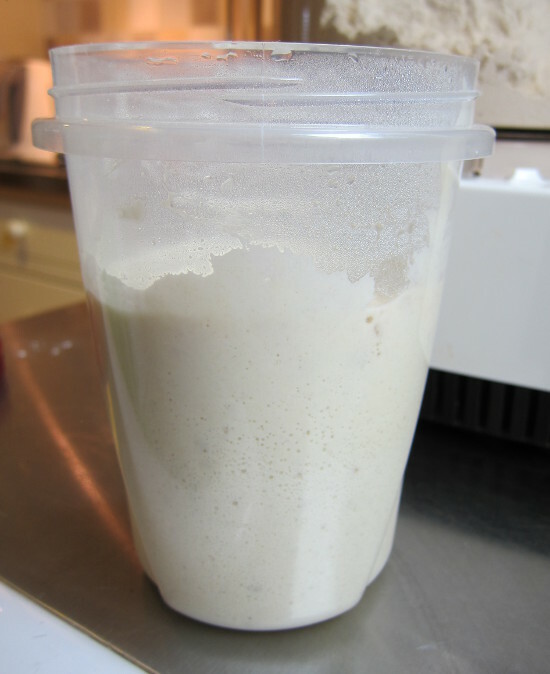 Vigorously mix flour, yeast and water in a 1-quart lidded container until it looks like a batter. Cover tightly and set aside to rise until it doubles in volume, about 3 hours (can refrigerate 24 hours and return to room temperature). 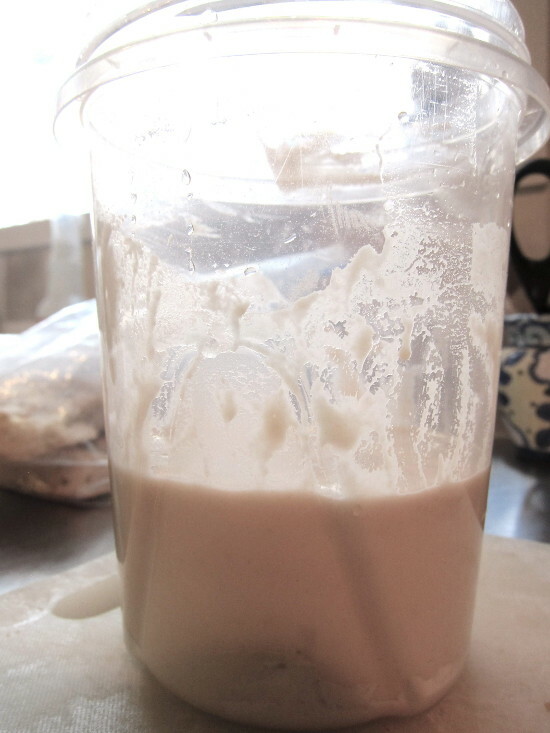 Fit a food processor with metal knife blade or use a mixing bowl. Add flour, salt, oil, wine and water. Process or stir to mix. Then add the risen starter and process or knead until dough is very sticky, smooth and blistery (about 1 minute in the food processor or 10 minutes by hand). Do not add additional flour. Rinse a large bowl with warm water. With floured hands, transfer dough to bowl. Cover tightly with plastic wrap or put bowl in a large plastic grocery bag and clip the bag closed. Set aside to rise until triple in volume, about 3 to 4 hours. Pour olive oil into a 19 x 12 x 1” rectangular baking pan, turning pan to coat the bottom evenly with the oil. Sprinkle 1/4 teaspoon salt over the oil. Pull dough from bowl without kneading, turning it into the oil in the pan and flipping it over so both sides are drenched in oil. 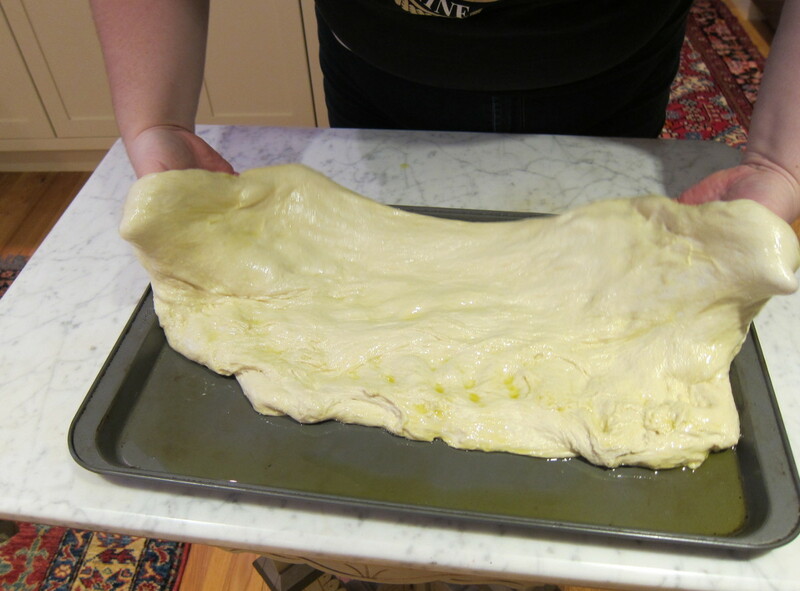 With finger tips or backs of your hands, catch dough underneath and stretch it like pizza to fit pan. 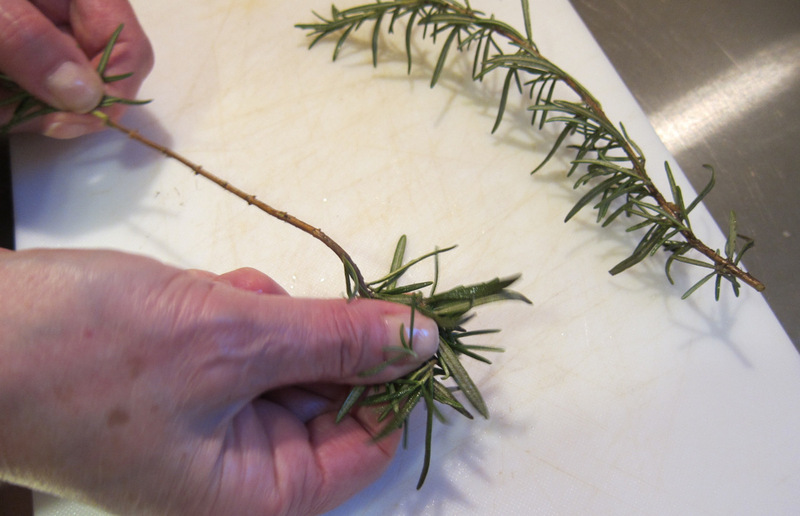 Crush dried rosemary leaves in your fingers or coarsely chop fresh rosemary. Sprinkle rosemary evenly over the dough, making dimpled oil-filled indentations in the top as you work. Sprinkle remaining salt evenly over the top of the dough. Tent the pan loosely with plastic wrap or 2 plastic grocery bags taking care they don’t stick to the dough. Set it in a warm space and let rise until doubled, about 2 hours. Heat oven to 350 degrees. Bake until golden, 30 to 35 minutes. Serve lukewarm in squares or slice into larger pieces and split those in half for sandwiches. On a trip to Genoa I gained access to a bakery and was able to watch their method for making focaccia. This recipe is the result. The toppings are always herbs or vegetables — otherwise it’s a pizza. I’ve made it in a smaller pan but find the texture to be better in the larger size baking pan. Mine is nothing special. The brand is Baker’s Secret and while the overall measurements are 19 x 12 x 1” the inside measurement is 11 x 17 x 1”. This size pan will optimize the thickness. I like to use the starter as soon as it’s risen. 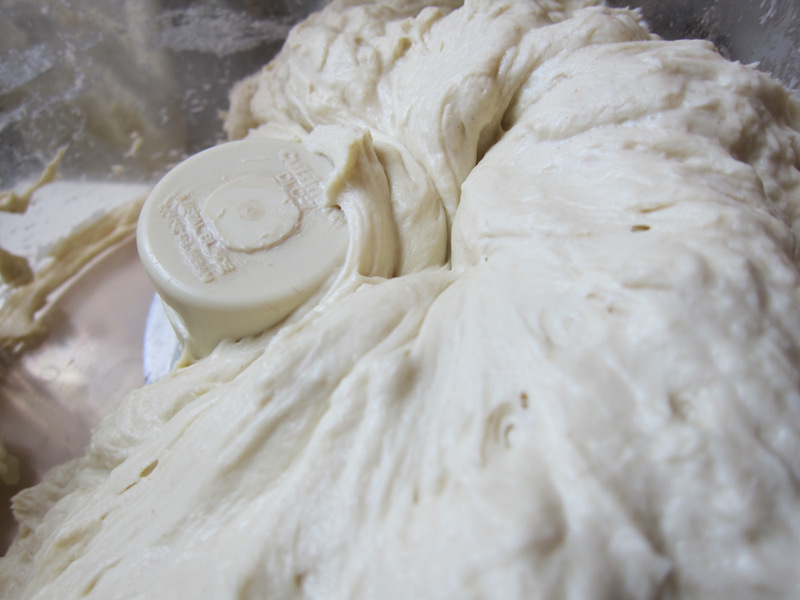 But I often throw the kneaded dough into an oiled zip-lock back and let it rise in the refrigerator overnight. 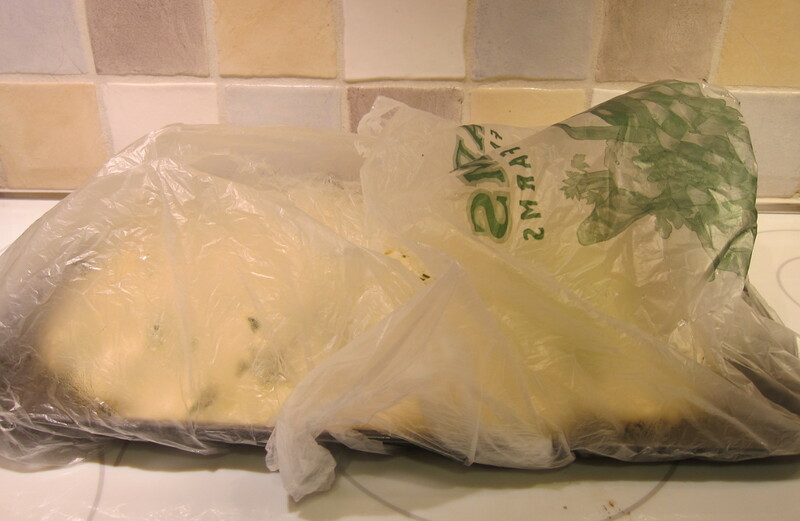 While the chilled dough should rise to some degree in the bag, and will be easy to handle once it’s removed, it will need at least twice the time to rise (i.e. perhaps 4 hours) once it’s in the pan and topped with rosemary and salt. It can be baked late at night, cooled, and then stored in the double grocery bags overnight. Herbs de Provence, oregano, summer savory or sage can be substituted for rosemary. Basil doesn’t do well in the oven. Alternately, very thinly sliced tomato, coarsely chopped olives, or a thinly sliced onion can be combined with herbs for the topping. The topping needs to be of relatively dry ingredients. Anything that gives off liquid during baking will make the top gummy. I also don’t advise changing the amount of salt since vegetables and other herbs will needs it the same way rosemary does. Goodness that looks perfect!! Thank you for the great recipe, pics and advice. This looks incredible and I cannot wait to make it!